치앙마이, 태국의 타이 타이 호스텔 | 호스텔월드에서 예약하세요. Whether you travel together as a group, a couple or as a Solo Traveler, you can be sure that you will be well treated from us like we are your traveling companion. 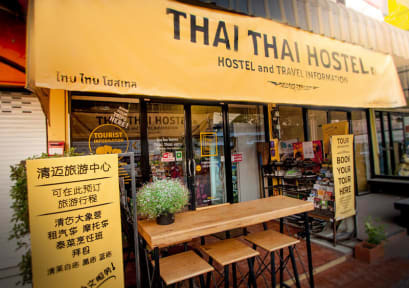 From checking-in at our hostel to traveling in Chiang Mai, booking a transfer or air ticket, finding a nice coffee shop, or having a Thai massage, we are ready to answer you all the questions with a smile and a willingness. Only you just ask us. We also provide a tour booking service. You can ask us to help you book any tour at any time, whether it is Elephant Sanctuary experience, Thai Cooking Class, City Tour, Zipline, Jungle Trekking, Bus or Mini-van tickets, Slow Boat transportation, or Motorcycle for rent. And even if you have not planed yet, we have many great ideas for you to make your adventurous experience an unforgettable experience. 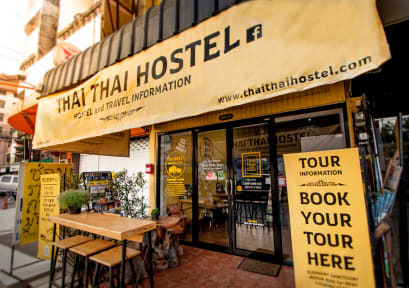 Finally, with the Special Trip recommendation from us, Thai Thai Hostel, you can also visit some new places where you will be surprised that why no one ever tells you about this place! With our 24-hour service, whether you are checking-in early in the morning or late at night, we will be here to help you. Maybe we are just watching a movie at the reception desk or play the game while waiting for you to come to greet us. Early check-out? What time? 4 AM? Oh, no problem! Tell us, if what you want a taxi. We will arrange it for you and be here to make sure that you leave on time. With both a private space and public areas, you can relax like staying at home. You can watch a good movie through Netflix on a big screen TV, lying down on a soft sofa with a pizza in your hand. Or you can choose to rest on the sun deck where you can meet new friends exchange the wonderful experience with a cold beer in your hand. Or you can do some sunbathing during the daytime and see the view of Doi Suthep Mountain while getting your skin tanned. Now you see why we are the hostel you have to choose. Many travelers just like you who have stayed with us and go back with a lot of great memories. You can see their awesome reviews on the hostel world. 1. Breakfast: 7:00 A.M. – 10 A.M. including Fresh fruits, Toast and jams, Cereal and milk. 3. Free Drinks [24/7]: Coffee, Tea, Hot Water, and Cold Water. 4. Free Strong Wi-Fi Connection. 6. Feel like a home atmosphere with music playing all day long. It was very nice and cozy hostel. Room and shower boothes are definitely clean. If I go chiangmai again, I"ll go this hostel! 위치가 좀 애매했던 것 빼면 좋았던 숙소 투어 가격은 인터넷으로 찾아보고 등록하세요.